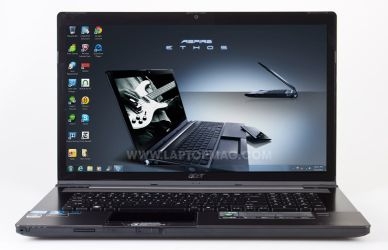 Laptop Thoughts: Acer Ethos Provides Movies In Your Pocket! Really Big Pocket! Acer Ethos Provides Movies In Your Pocket! Really Big Pocket! "With a full HD display, Dolby speakers, and Blu-ray drive, the Ethos 8951G packs a veritable home theater into an 8.8-pound chassis. But with a price of $1,599, this system faces hefty competition for your hard-earned cash. Read on to find out if the Ethos is awesome or overkill." When I see notebooks whose screen is 17 inches or bigger, I cringe. Maybe I am just reliving old memories. A few years back, I decided that a lovely 17" high resolution screen laptop was the answer to all my problems. It would be powerful, offer lots of screen real estate and have some graphics punch for when I wanted to have fun. Oh, and it would be portable. Cue laughter. My solution ended up becoming a heavy lead ball that, I swear, made me shorter by several inches as I carried it around the world. At 8.8lbs, the Acer Ethos is not that much lighter than my one time joy, but does offer a fair bit more. Desktop replacement laptops do have their place, and there is nothing like having a beast of machine with you at all times, but if I were to make one recommendation, is that if you do pick up one of these babies, make sure you invest in a really good laptop bag. That or a sherpa.